After riding the Surly Larry tires on the Ox for the last couple of years–including a good deal more pavement and dirt riding this past summer–I figured it was about time for new tires. This became all the more apparent after the snow fell, and I found myself without much traction no matter what the tire pressure was. When I picked up the Necro-Pug from the shop yesterday, I also brought home some new rubber for the Ox–which is also due for a cleaning and tune-up. 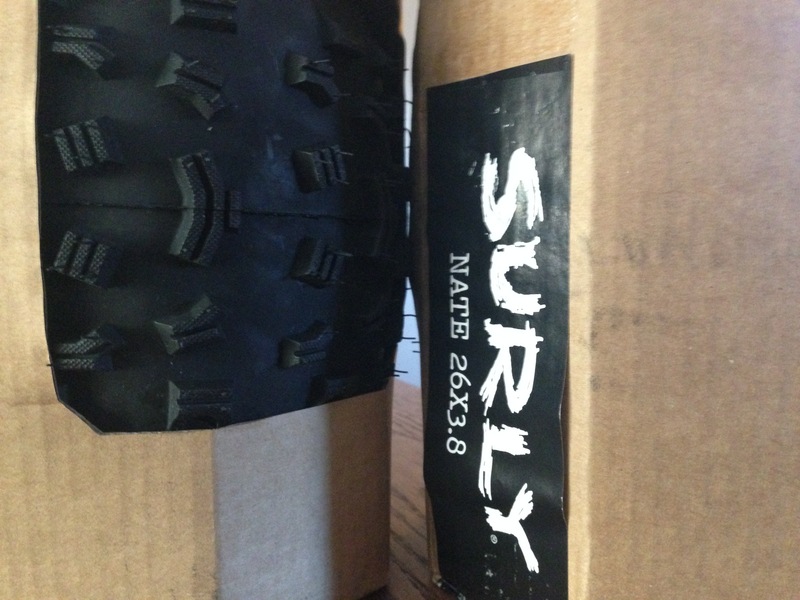 The Surly Nates have a completely different tread profile than the Larrys. More and bigger knobs, more space between them for shedding snow and mud. I’ll probably switch back to the Larrys in the spring for gravel road and pavement riding, but these will give me the grip I need for riding in the snow, especially on hilly terrain–something that the Larrys were never good for, even new and run at very low pressures.